Almighty God, I commend to your gracious care and keeping all the men and women of our armed forces at home and abroad. Defend them day by day with your heavenly grace; strengthen them in their trials and temptations; give them courage to face the dangers that surround them; and grant them a sense of your living presence, wherever they may be; through Jesus Christ our Lord. The kingdom of heaven is like a landowner, who went out early in the morning to hire laborers for his vineyard. When he had agreed with the laborers to pay them a shilling for the day, he sent them into his vineyard. He went out again, about the third hour, and saw others standing idle in the marketplace. He told them, 'You also; go to the vineyard, and I'll pay you whatever is right.' And they went to work. And he went out yet again about the sixth and the ninth hour, and did likewise. About the eleventh hour he went out again and found others standing. He said to them, 'Why are you standing here all day idle?' They replied, 'Because nobody has hired us.' So he told them, 'You also, go to the vineyard'. The invention of accurate clocks came surprisingly late in history. The Romans were amazingly advanced in some ways; the sewage system in Londonium (circa 300 AD) was far better than that of London in 1800. But the pendulum clock did not appear until 1657, and clocks accurate enough for ships to determine their latitude came 100 years later. Agricultural peoples, like the Hebrews in today's passage, generally divided the day into two segments. The daytime would have started around 7 a.m. and ended around 7 p.m. So, the third hour would have started about 9:00; the sixth, 12:00 noon; the ninth, 3:00; and the famous "eleventh hour" would have run from 5:00 to 6:00. Then (as now) farmers went to bed early and got up at daybreak, especially since they didn't have electric lights (much less television!). The dome of St. Andrew's Cathedral in Patras, Greece, depicting "Christ Pantocrator". 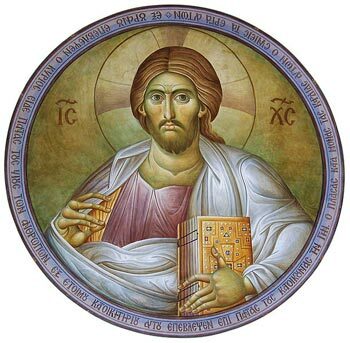 Christ Pantocrator is a conception of Jesus as the Almighty, or "Ruler of All things", and is a common depiction of Jesus in the Byzantine or Eastern Orthodox churches.